to the realization of the mystery that underlies all forms." I was delighted to discover another legend from a local Native American tribe, the Lenni Lenape. 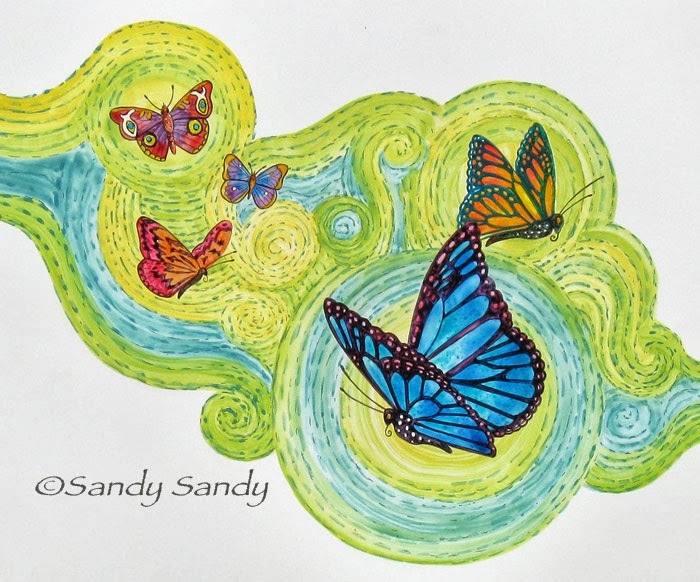 "How Butterfy Came to Be" tells of how Creator made butterflies from a sack filled with all the colors of nature. As an afterthought, he took the songs from the winged ones and added them to the mix. Upon opening his sack, thousands of beautiful singing butterflies filled the air. The people rejoiced but the songbirds were not happy. Creator agreed that it wasn't fair to take away the one thing that set the birds apart from the rest of creation. So that is why the butterflies carry their beauty in silence today. 20" x 24" matted - $369. / framed - $399. / art only - $319. I really struggled with the challenge this time. I am sure some of you other participants can relate! Yikes, I got behind a couple of times and had to do two "keepers" in one day. I really WAS painting everyday, sometimes more than one - sometimes repainting a piece two or three times before I was happy with "showing it in puiblic". That's the luxury of not being in a challenge. ☻ I made sure I never got more than one day behind though, because if I did, that would mean doing three paintings in one day just to catch up! Daily posting has been very time consuming for me too. I was relieved to have finished this last painting yesterday on time! After two attempts of getting a decent photo of it though, I decided to wait, reshoot and post it today. I gave a private Yupo lesson this morning, so time was spent organizing piles of books, files and supplies and "de-challenging" my mind and studio. There were times this past month, when I wasn't so sure I could do it this time. I'm very competitive with myself and quitting or not meeting my goal would have been more painful than pushing aside everything else in my life to finish. I feel like a kid who has had awful growing pains and has just gone through a major growth spurt. Yes, growth can be uncomfortable, even painful at times. Now that it's over, I can whole heartedly say," I am really glad I took and met Leslie's Saeta's 30 Paintings in 30 Days challenge for the second time this year"! Woo Hoo! Time for a celebration! without all you guys cheering me on.Thanks so sooo much!